What we have this week is LudoArt’s Master Thieves, a beautiful game that only comes under the heading of board game by definition because one thing is does not have is,well, a board. Since Master Thieves is very focused on the game materials, lets have a look at them first before we dive in. The first thing that catches the eye when opening the big, wooden box of Master Thieves is the wooden cube that takes up most of the package, styled like a jewellery case. (Actually, it looks a bit like a puzzle box, but no Cenobites ever jumped us while playing …) The case has three levels with a drawer on each side. The levels can be rotated individually. Each of the 12 drawers has a top and a bottom compartment – 24 compartments in case anyone is counting. Half the drawers are longer than the rest, hiding secret compartments behind the regular ones, so the total goes up to 36. Keep that number in mind, it will haunt you. Besides the box of many drawers, the game contains a bundle of velvety pillows to store your gems on and – not much of a surprise now – a whole lot of gems: diamonds, sapphires and ruby. Disappointingly, they aren’t real. But if fancy strikes you, you can easily play Master Thieves with real gems without destroying the game. Master Thieves players are multi-talented criminal masterminds: thieves, smugglers, jewellers selling fake gems and sometimes private investigators. But on each turn, you only chose one of these roles: each player chooses a role from his set of cards and places it on the table face down. Now, before anyone else, all Smugglers reveal their role card and have their turn: Smugglers get to open one drawer and take all the gems from the top compartment and put them on the one red pillow- if any gems fall out of the bottom compartment, that’s very unfortunate for the Smuggler who opened it as he won’t receive his part of the haul. Stuff falling out of the bottom compartment is generally bad for everyone – try to avoid it. 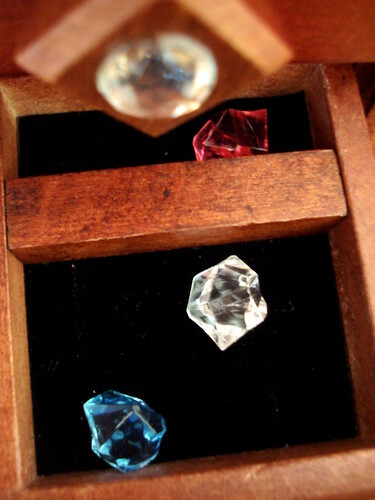 The Smuggler also puts on fake gem – they look just like real ones, but players keep them on the white pillow and start with 10 of them – into the drawer. 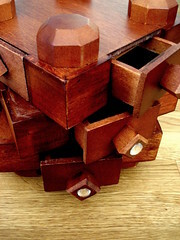 Every time after opening a drawer – no matter which role does it – the player may also twist the cube and turn it upside down if he so wishes. Good luck remembering where the gems are. 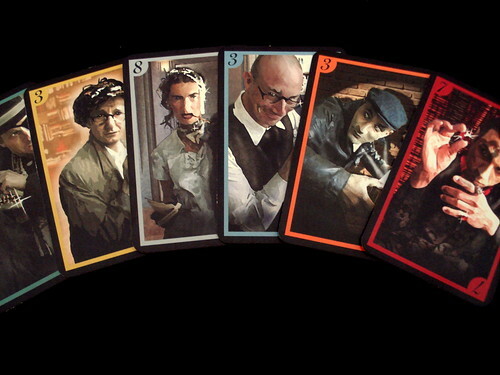 After the Smugglers are done, all other players reveal their role cards. The Smugglers split the gems from the red pillow unless they are outnumbered by the Detectives. Next go the Jewellers: they place one fake gem in a drawer and may also put their alarm there. When the alarm falls out the bottom of the drawer later in the game, all gems that fall with it go to the Jewellers black pillow, the one that has the real gems. The Jewellers’ wives may put a gem into a drawer, even if there was something in the bottom compartment. They put an additional gem for every Detective present in this round. After the Jeweller family come Thief and Master Thief: they both open one drawer and take all the gems inside. The difference between them is that the Master Thief is the only character who can open the secret compartment. Some of those are full of very valuable rubies, so opening them may turn out profitable. After everything else has happened, the Detectives have their turn. Detectives are the only ones to never touch the jewel case – they know about finger prints. However, they are not quite the honest heroes we would like them to be; they split the gems from the red pillow: the Smuggler’s haul if they had to leave it behind and all the gems that fell from the bottom of a drawer. After everyone is done, you do not take your cards back; that only happens after you used each role once. Playing the Jeweller’s Wife (who is, actually, a female Jeweller, but that’s harder to put on a card in English) all the time to get rid of your fake gems quickly is not an option. Although you would want to, because the first player to hide all their fakes ends the game. Points are awarded for each real gem you own now and lost for every fake you have left. No, you’re not. At least not yet. But wait until the jewel case has been twisted and turned a couple of times, then you will be. Really, Master Thieves is hard. Not hard to learn, the rules are explained in five minutes. Not all that hard to master, either. There is only six roles to choose from. Which one you use is rarely an obvious choice – except when everyone is down to one card – but as long as you remember which cards your opponents have left it’s not a decision that will make you sweat, either. No, Master Thieves is quite simply hard to play well: you’re trying to keep track of the contents of 36 compartments. And the jewel case keeps twisting and turning. And the more players there are, the more the case will be twisted and turned before it’s your turn again. Keeping track of two drawers – one with gems on the top and one with gems on the bottom, so you always have an option – is possible for most people, but even this requires some concentration. And if those drawers were profitable, someone else will have been tracking them and clear them out just before your turn. So you will want to track four drawers – and maybe you will, but I freely admit that I failed at that task completely. That’s not a huge problem, so does everyone else here and our games end up pretty balanced. Oh, and you’ll also want to remember who played which role already. The role cards are well balanced, each of them gives you reasons to use it other than “it’s what I have left”. Choosing the right one for your turn does require some intuition and the memory which cards were used already. Especially Smugglers, Detectives and the Jeweller’s Wife reward you for guessing the other players’ roles correctly due to their interaction and it’s an incredibly rewarding feeling to put five gems into the case on your first turn because you played the Jeweller’s Wife when four people thought it would be a Smuggler’s round and consequently played the Detective. This kind of satisfaction is obviously only possible with enough players in the game – which brings us to a small downside: Master Thieves is not equally fun across the whole range of player numbers. It’s always a fun game to play, but with less than four people the interaction between the roles just doesn’t happen on most turns. On the other hand, with 8 players it’s utterly impossible to keep track where anything is. The perfect number of people to play Master Thieves is from four to six. The components, as sufficiently mentioned above, are gorgeous. This is a game you can leave out on the coffee table when your non-gamer in-laws are coming over. Everything is very well-made and well-designed and games made from solid wood are rare enough to be remarkable. After many games, there is a small issue that some drawers don’t fight as smugly as they used to and may sometimes go flying when the case is turned with too much enthusiasm. It’s likely not possible to avoid that when working with wood, but it’s still a bit vexing in the middle of the game. However, after the second time you hit someone in the face you do learn to be more careful – trust me, I know. What we have here is a very good game in both material and fun, and also a game that I believe couldn’t be made on the cheap because it just wouldn’t work with a plastic case. It’s luxurious by necessity. The price tag may understandably prevent you from running out and buying it straight away, but this is a game to keep in mind next time you’re looking for a gift for the special boardgamer or jewel thief in your life. No, strike that. For the special boardgamer. The special jewel thief in your life can easily buy his own.